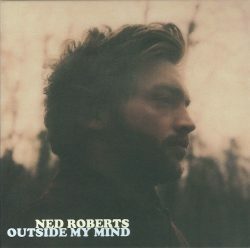 “Outside My Mind” is the follow-up album to 2014’s eponymous debut from London based folk artist Ned Roberts – and it’s a confident and well-produced recording. In fact, in many ways this album belongs almost as much to producer and multi-instrumentalist Luther Russell as to Roberts himself, with Russell providing drums, electric guitar, piano and backing vocals as well as studio guidance. But it is Ned Roberts’ album and it’s a strong one. Ned has a great voice, slightly reminiscent of Nick Drake but also with a little James Taylor in his tone – no bad thing for a singer-songwriter. He’s also a fine guitar player in the folk finger picking style and his songs, pulled together over a three year period for this recording, are very listenable indeed. This album was recorded in L.A. and you can hear that in much of the production; there’s a sense of space and warmth to the recording that is, perhaps, reminiscent of some of the recordings of the Laurel Canyon era and it’s no surprise that Roberts has drawn comparison to such folk troubadours as Tim Hardin and Leonard Cohen. For all its American influences there is still a strong sense of Roberts’ homeland and his songs carry great lyrical detail; listening to these songs you can see and feel the London landscape that infuses them, particularly on tracks like Through the Arches and Angel Station. Ned Roberts is clearly a talented and enjoyable singer/songwriter and there’s a sense that, with a killer song, he could be a major artist. That song isn’t on this album but if he continues to develop in this way you have to suspect that it won’t be long in coming. Definitely one to watch. Second album from London based singer/songwriter builds on early promise.